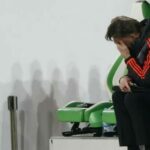 Fenerbahce beat Manchester United 2–1 in the Europa League, adding to the woe of a Jose Mourinho side that is now off to a worse start than David Moyes or Louis van Gaal managed. 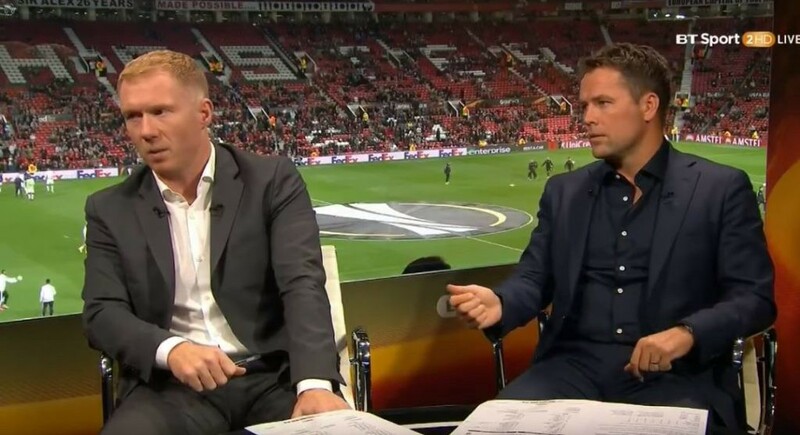 Former Man United players Paul Scholes and Michael Owen worked the match for BT Sport and used their copies of the team sheet to express their feelings on their former club’s fortunes, as revealed by colleague Jake Humphrey. What immediately jumps out here is the pen-mashing rage evident in the hurricane of swirls at the top of the page. The circular motions clearly symbolize Man United’s fortunes going down the toilet in recent years. 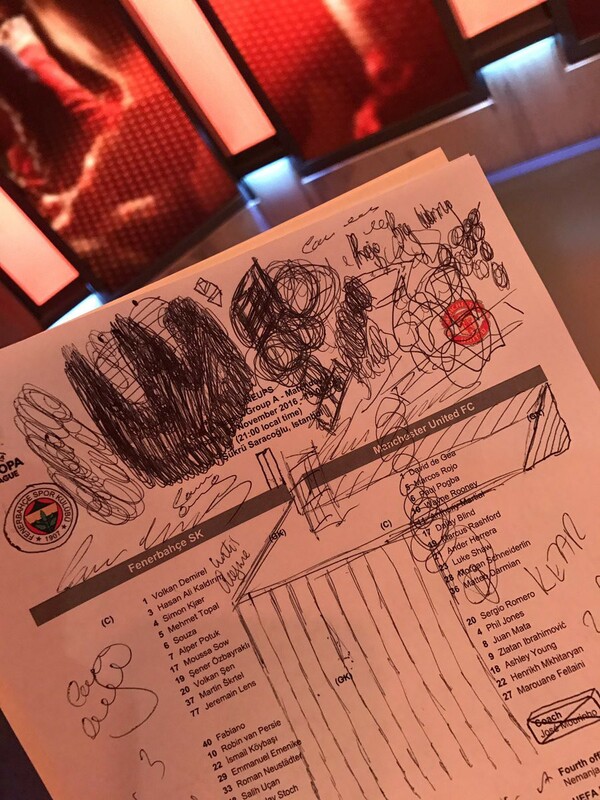 Beneath that is what could be a sketch of a prison cell, representing the team’s stifled play and inability to escape their poor form. 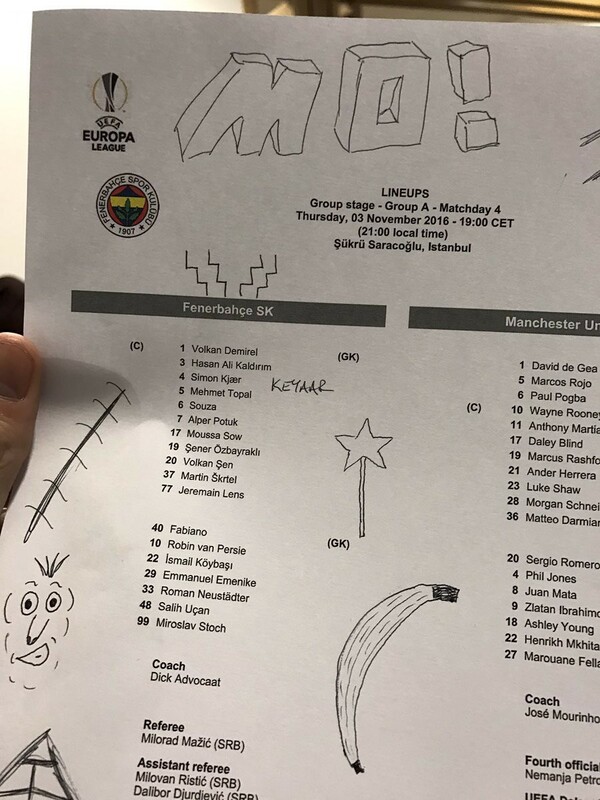 Perhaps most telling is the fact that he put a box around Jose Mourinho’s name and then crossed it out. 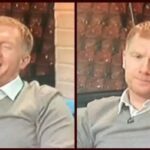 Though Scholes stated during the broadcast that he believes Man United should stick with Mourinho for “the next couple of years at least,” it seems the 11-time Premier League champion is losing patience with the Portuguese. So that’s a snapshot of Scholes’ tortured emotions. Now how about Michael Owen? His own initials printed in big block letters (and spiced up with an exclamation point), a magic wand, a banana, the phonetic spelling of Kjaer, a stitched up wound and a cartoon face. If I had to guess what this all means, I’d say that Owen believes he could be scoring more goals than Zlatan Ibrahimovic right now, that Man United need a magic spell to get the best out of Paul Pogba, that he doesn’t know how to pronounce conjoined letters, that bananas are yummy, that it would be funny if a piece of paper had a paper cut, and that Mr. Parenthesis Head is going to be Britain’s next great children’s cartoon. Deep thoughts. Deep thoughts indeed.